Woodard Cleaning and Restoration has earned a spot in The St. Louis Post Dispatch’s Top Workplaces program for the third year in a row. 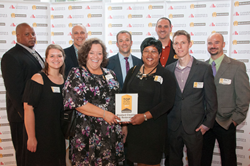 Team members from Woodard attended the Top Workplaces reception to accept this award on the company's behalf. If you instill a positive company culture and lead with integrity while empowering your employees to succeed, you’re naturally going to create an awesome workplace filled with happy people. Woodard Cleaning and Restoration has earned a spot in The St. Louis Post Dispatch’s Top Workplaces program for the third year in a row! This is an especially meaningful honor for the Woodard team, since it is based solely on feedback provided by employees about their experiences at Woodard. Each year’s feedback is resoundingly positive, illustrating the focus Woodard’s leadership team has in creating a strong, motivating, and positive culture. Employees of all companies participating in the Top Workplaces program were surveyed earlier in the year by a third-party information gathering company about their experiences at work. Responses were collected and grouped by Organizational Health (overall, how employees feel about being a part of the organization), The Basics (feedback on benefits, pay, culture, etc. ), and Engagement (how motivated and engaged employees are while at work). Each higher level component contains smaller groupings as well, all designed to give an employer candid, valuable feedback on its employees’ experiences. Since the survey is conducted by a third party and all responses are anonymous, it allows the team to feel free in giving honest feedback, which employers are encouraged to read, digest, and use as a basis for any necessary improvements. Over the past year and a half, Woodard has really honed in on articulating its culture, plans for the future, and mission in the community. Through extensive work by all members of the leadership team, Woodard has been able to define its core purpose as “Helping people get back to their lives,” its signature strength as having “the most capable employees,” and its envisioned future as seeing “a day when [Woodard is] known for growing leaders in [the] company, industry, and communities.” Being able to articulate these key components of Woodard’s culture has created an open, positive, and motivational environment across all of Woodard’s teams. “I truly believe that putting these things into writing, communicating them on a daily basis with our teams, and living up to our core values of Do What’s Right, Serve Others, and Learn Every Day on a daily basis are the keys to us being a Top Workplace,” said Woodard’s Chief Revenue Officer Dave Christoff. “If you instill a positive company culture and lead with integrity while empowering your employees to succeed, you’re naturally going to create an awesome workplace filled with happy people,” continues Mr. Christoff. If you’d like to join the Woodard team, visit WoodardJobs.com to see current job openings. Based on survey responses from more than 35,000 people, the St. Louis Post-Dispatch is able to name 120 area employers as Top Workplaces for 2017. These employers — ranging from small businesses to some of the region's biggest corporations — share key qualities: effective leadership, strong values, clear direction and motivated workers. 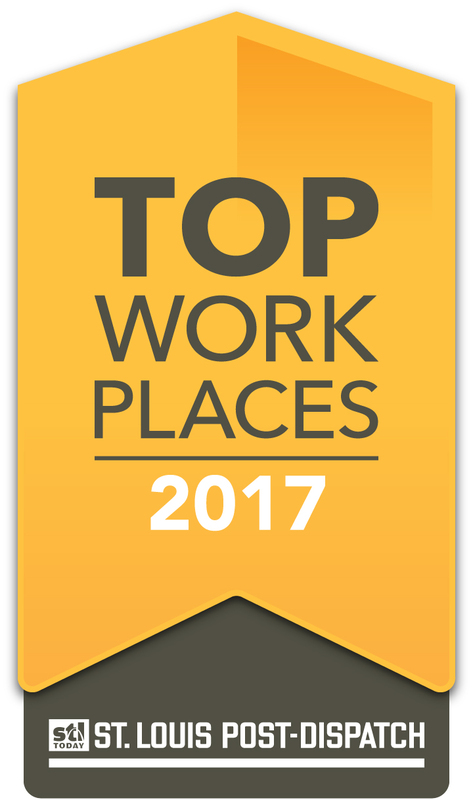 To see a complete list of Top Workplaces for 2017, visit the winners page. Woodard Cleaning & Restoration Services was founded in 1946 as St. Louis' first in-home rug and carpet cleaning company, and is now the area's largest commercial and residential cleaning company for carpet, rugs, furniture, and hard surfaces. Additionally, Woodard Cleaning & Restoration is a preferred provider of water and fire mitigation services, as well as disaster reconstruction for residential, commercial, and institutional facilities. For more information, visit Woodard's website at Woodard247.com, or call (314) 961-9102.